Ibo et Non Redibo: Is Canada a Nation of Thieves? Before reviewing Christian doctrine on alms-giving, let us have a look at the figures in Canada today. The article cites statistics released by Statistics Canada for 2010. In that year, the average Canadian gave $446 to charitable and non-profit organisations. In the same year, the average disposable income (i.e., the amount left over after all taxes) was $29,707. This means that, on average, Canadians give a mere 1.5% of their disposable income to charity. Moreover, the median amount Canadians gave to charity in 2010 was only $123. By definition, this means that half of Canadians gave more than $123 and half gave less. In effect, it indicates that the average amount of $446 is due to a small percentage of people who give a lot more than their compatriots, while the great majority of Canadians give less than $446. All of this suggests that for most Canadians, giving money away is not a high priority. This is made evident if we compare how much they spend on other things. In 2010 the average Canadian spent roughly 10% of his disposable income on food, alcohol and tobacco, 4% on clothing, 7% on furniture and 10% on entertainment. With charitable donations at 1.5%, this means that we Canadians tend to spend more than six times as much entertaining ourselves than we do helping those in need. The right to private property has always been upheld by the Church. It is proper to a person’s dignity that he be able to provide for himself and his dependants from his own possessions. As Pope Leo XIII once cleverly pointed out, if there is no right to private property, then the tenth commandment―not to covet your neighbour’s possessions―makes no sense. At the same time, the resources of the earth are for all people, not just for some. The right to private property is not absolute, but rather exists in function to the universal destination of goods. A society in which only some enjoy the use of its wealth, while others lack the means to live with dignity, has perverted this right. Those who have an abundance of possessions have a moral obligation to ensure that those without enough are redressed. Thus, giving out of one’s abundance is not an act of generosity but of basic justice. Not to share our surplus wealth with those who are in need is an act of theft, for we are depriving them of bounty that is meant for all. If I help the poor out of my surplus, I have no reason to pat myself on the back and think that I have done something extraordinary, as the CBC article suggests. Rather, our attitude should be closer to the humble servant of the gospel: “When you have done all you have been commanded, say, ‘We are unprofitable servants; we have done what we were obliged to do.’” (Luke 17: 10) Of course, this is not to say that we should give alms with long faces, “for God loves a cheerful giver” (2 Cor. 9:7). But our good cheer should not be vainglorious. It is by no means a novel or fringe idea to equate refusing to share excess wealth with theft. In fact, it is an ancient doctrine of the Church which is maintained up until this day. The foregoing clearly demonstrates that those who enjoy an excess of wealth have a grave responsibility to share it with the more needy. But what does this mean practically? Those who like clear-cut formulae will be disappointed. The Church does not specify with exactitude what “excess” means, nor what it means to “sustain life fittingly and with dignity”. To do so would be foolish, since conditions vary so much across the world and even in our own country. Every Christian household―in fact, every household of goodwill, since we are treating a principle of natural law―must discern for itself how it is justly to use its wealth. Though the ancient practice of tithing, or giving away ten percent of one’s produce, often functioned more as a sort of tax rather than alms proper, it might be a good baseline for many when starting their discernment. Of course, ten percent could be far too much for a family which is barely making ends meet, or it could be too little for a six-figure income: this illustrates exactly why there can be no prescription. But for many, it is probably a not-unrealistic target. Perhaps the most important thing is to plan. 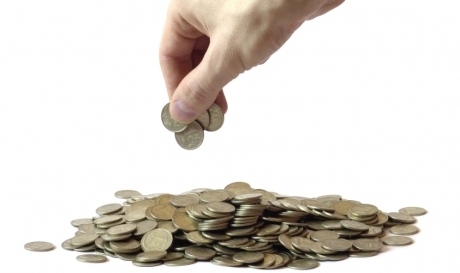 When the household is budgeting, is alms-giving given serious consideration? Is money regularly budgeted for charity as it is for food, shelter, entertainment, travel and retirement? What are the sources of excess or waste in the household’s lifestyle that could be channelled to those who are in need? At the end of the film Schindler’s List, the title character asks aloud how many more people he could have saved if he had sold more of his possessions. He realises that if he had sold his car or even his Nazi membership pin, he could have saved more people from death. What more can we do? It is a question we will always have to wrestle with, no matter how much of our wealth we share. As I write this, I am painfully aware that when I was a layman and had my own disposable income, I certainly could have been more generous with it. And throughout this article, I have not even considered the question of other important ways that we can contribute to the common good, such as volunteering time. Perhaps in the amount Canadians "give" you could consider the amount we have decided to give "structurally" through social and governmental choice, namely various taxes and social services? Paying a tax is not necessarily the same as voluntary cheerful giving, but ultimately the choice to have such taxes is in part for considerable and laudable reasons. You raise a good point and one that I would have addressed if I had made my post significantly longer! (Similarly, there were other points I left out, such as how to discern which charities to support, the difference between alms-giving and supporting the Church, and so on.) But I'll give three points in response to your comment. Second, you are quite right mention that we contribute to the common good by paying taxes. In fact, the previous post on this blog was about just that. The state plays an important role in the common good, and as responsible citizens we need to support that. Of course, we should keep in mind that most of our taxes do not go directly to the poor, as most of our alms-giving should, ideally. Finally, I think an argument can be made that paying taxes is voluntary in a certain sense. In a democracy, everyone influences the government, if only in a small way. We elect the parliaments that set our tax agendas. We have the right to communicate with our members of parliament about how government money should be spent. We are part of the culture that informs the spending priorities of our rulers. The taxes we pay are the taxes we have collectively chosen as a nation. 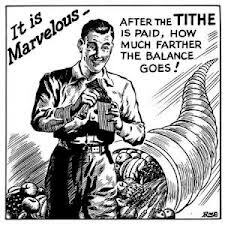 Adam, as a professional fundraiser in the Catholic church, I get asked a lot about tithing. My position is that every gift given with great love and a little sacrifice, given in gratitude to God for His abundance, matters. Tithing is much more clear-cut and simpler, but it leads us into a formulaic and not relational type of giving. You've hit every point and note here perfectly from my perspective. So many in my field have discussed that article, but you are the only one who I've seen look at it from a spiritual perspective. As a professional "gift planner," I love your comment on planning giving into household budgeting. It's a core part of living as a "good steward." The charities we help have a responsibility to inform us of how our funds are used and we have a responsibility to give out of love and with care and interest not just as an impersonal transaction - ie. my pet peeve are the "would you like to add $2 to your bill for charity?" I see so often at grocery store checkout counters. I'm honoured to have received your nihil obstat! Keep up the good work in your diocese.